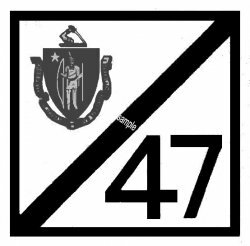 1947 Massachusetts FALL Inspection Sticker - $20.00 : Bob Hoyts Classic Inspection Stickers, Add a Final Touch to your Restoration! This is a 1947 Massachusetts FALL INSPECTION Sticker. They were issued from October to May of 1948 and they were good for one year. Many thanks to Paul Morrison, Foxborough Mass, who supplied us with an original to make our reproduction.